Apple's newly minted Xcode 4 integrated development tool reflects a strong investment in building software designed to create new software, particularly for the iPhone and iPad. Developers say it could also signal a new push into Adobe's territory, if Apple delivers a similar development environment aimed at building HTML5 web content. Xcode 4 was previewed at Apple's Worldwide Developer Conference this summer. The company just recently released a fresh private beta of Xcode 4 to all of its developers. The newly revamped workflow helps developers organize the code and supporting files that make up the applications they ship for Mac OS X and iOS devices, integrates graphical interface layout tools with coding windows, and incorporates document version control to track changes over time. 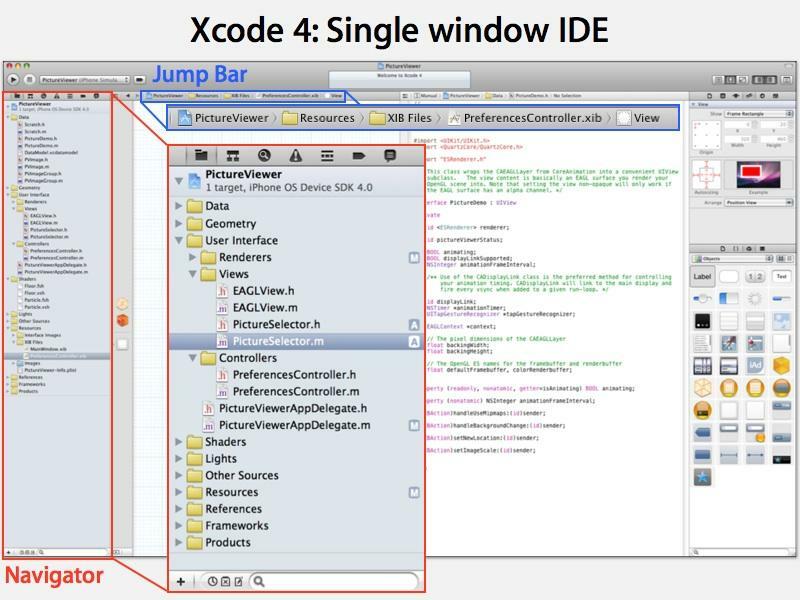 Appleinsider featured the major new changes in Xcode 4 when it first arrived. Developers note, however, that the resources Apple is pushing into its development tools, in large part due to the wild success of the iPhone App Store, will make it easy for the company to reuse its efforts to deliver solutions for parallel development tasks. One example of how the company's significant investments in creating Xcode 4 could be applied is in shipping a web development tool aimed at creating HTML5 content for the web and for use within web-based tools such as Apple's iAd mobile advertising program, digital books and web apps targeted at iPad, and its iTunes LP and iTunes Extras content. If Apple leveraged the Xcode 4 work it has already completed (and has paid for as part of its investment in fostering iOS App Store and Mac software) to target HTML5 development, it would propel the company past other fledgling efforts to serve the tremendous latent demand for an integrated web development tool, and could establish the company as a premiere source for web creation tools. On page 2 of 3: This all happened before.